To properly understand Chauskoskis’ Pawnny (2011), one must first become familiar with the paw! vinyl sculpture by Coarse (Mark Landwehr & Sven Waschk), which is pictured to the right. Having debuted in 2008, paw! depicts a fantastical monkey-rabbit hybrid, its entire form precisely balanced on one of its muscular forearms. And the fluid physicality of the paw! as well as its overall likeness was the basis for Chauskoskis’ Pawnny, which he reinterpreted onto Kidrobot‘s Dunny shape. A masterful merging of the two, the Pawnny maintains the recognizable form of the Dunny while recreating it in the pose of the paw!, though aspects of the latter do impose themselves. The stubby feet have paw pads added and the hands vary, the one upon which the whole resides being mitten-like, resembling that of the Dunny, while the raised one has defined fingers, akin to that on the Coarse sculpture. Then there’s the face, with its sculpted brow, nose, and jawline, as well as the two exposed teeth, perfectly capturing the paw!‘s visage. And by making the eye slits recessed into the face, it gives them greater variance from the whole and a feeling of true depth. While the topmost image to this article implies that a randomly packaged “blind box” issuing of the Pawnny occurred, that is — at this time — merely wishful thinking. The Pawnny design remains quite scarce, especially considering the 1,000+ collectors who have expressed desire in obtaining one. 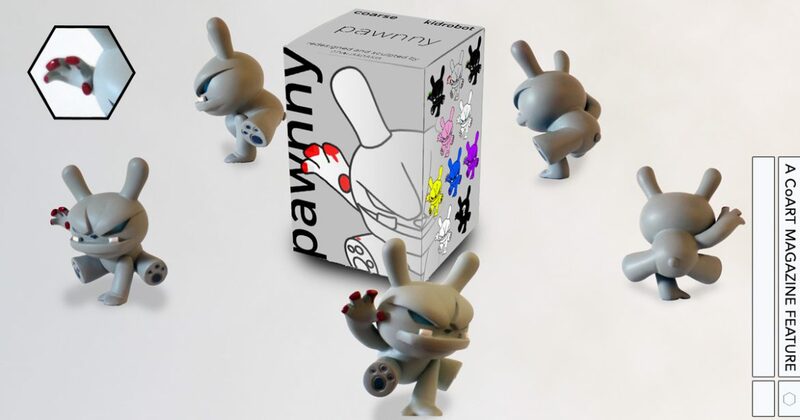 The original Pain rendition of the Pawnny, which was built on a vinyl Dunny form, was placed for auction in November of 2013 and came with an unpainted Raw version of the sculpture cast in resin. Only about 30 hand-painted resin versions in this size are confirmed to exist, most executed in the Pain and Blackout color schemes, though at least one rendition of each paw! release coloration was created as well as some unique variants, like Cool Blue and Chrome. Beyond these depictions on the 3 in. Dunny form, Chauskoskis created a 20 in. version for the Sacramento, California shop Dragatomi in 2014 and he has issued a few 8 in. tall interpretations since around the same time. The artist proclaims that he “love[s] the piece” but is “a bit tired of all the the delays I had with it.” That said, he still hopes that “in the future I can make a few more”. Rampage Toys' The Return of Rampage! !